While Saudi is a closed society in many ways, in other ways it is very versatile and open. Workers from India, Phillipines, UK, America, Holland, Bangladesh, Algeria, Egypt and so many other countries all come to make a living. Little neighborhood stores carry bits and pieces of food stuff from these countries. There are a wide variety of noodles, sauces and wraps for those who want to try new and different dishes. I tried a wide variety of these dry packaged noodles and it was usually a struggle, each time a new outcome, sometimes amazing and then sometimes not great! Directions were not in English and although I took notice of what worked each time, the brand that I had purchased would then disappear. When I arrived back to the U.S. I found some lovely fresh noodles in the grocery produce section. These could easily run $4 per package and I needed a minimum of 5 packages for our large family which did not make for an economical meal! A couple of years ago my daughter Fattima (Foof) found a recipe using spaghetti noodles and of course I laughed at her! I thought no way would anything so easy, taste so good! She whipped them up and they were delicious! So, this is our new recipe that we use when we want some delicious and quick Asian noodles. Place sauce ingredients in a medium size pan and put on the stove. Whisk on medium heat until sugar is dissolved and well combined. Cook spaghetti noodles according to package directions. After they are drained, return to cooking pan. Stir fry vegetables (except water chestnuts) in a few tbs.of olive oil until cooked to desired texture. Drain water chestnuts and add to vegetable mix, stir fry a few minutes longer. 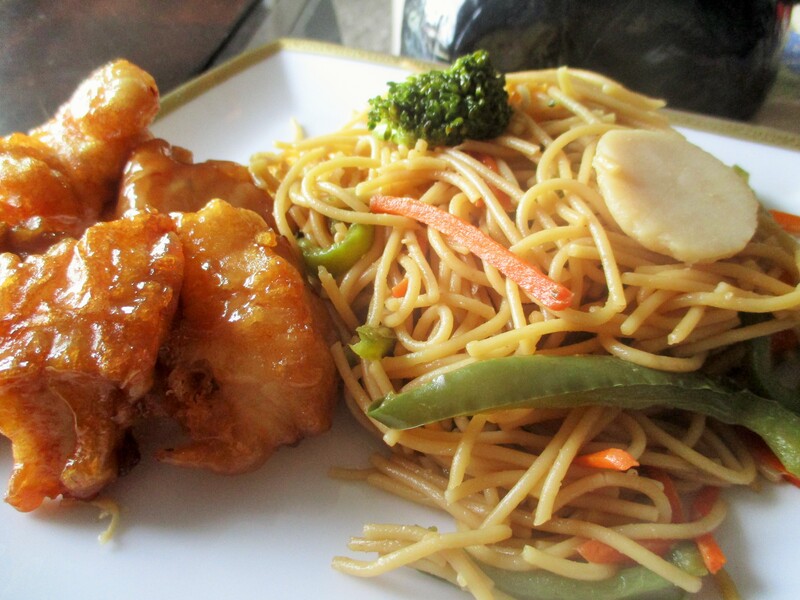 Pour sauce into the pan with cooked and drained noodles and toss well. Get the sauce completely mixed in with the noodles, add vegetables and turn on medium heat, gently toss to warm them and to get flavors mixed well.